There is a new addition to the Cockrell Butterfly Center Insect Zoo, a colony of leaf-cutter ants housed in a brand new exhibit! This leaf-cutter ant (Atta cephalotes) colony was acquired by the Cockrell Butterfly Center about 2.5 years ago from Guatemala. It began as a small, “softball-sized” colony that now has grown many times larger. The colony has been kept behind-the-scenes while the exhibit to house them was constructed. Now the ants have moved into their new home! The exhibit includes a foraging area, a vine highway, and “underground” nest boxes. 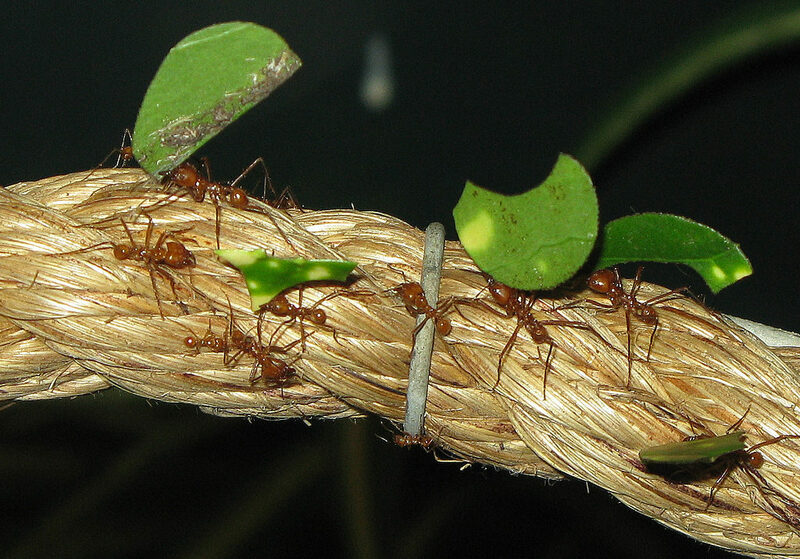 Visitors can observe the ants carrying out the variety of activities that keep the colony running. Figure 1 New Leaf Cutter Ant exhibit in the Cockrell Butterfly Center Entomology Hall. – Minims are the smallest workers. They will tend to the brood or care for the fungus gardens. – Minors are slightly larger than the minims. They act as the first line of defense and continuously patrol the area around the colony and attack any perceived threats. – Mediae are the foragers. They cut the leaves and bring the leaf fragments back to the nest. – Majors, also known as soldiers, protect the nest from intruders. They also clear foraging paths. All the ants in the colony are the sterile female offspring of the Queen. Her sole purpose is to reproduce, and in her lifetime (of over 20 years) she can produce millions of eggs. She can be up to 2 inches long- many times larger than any of the workers. Adrian Pingstone (Arpingstone). Source: Wikimedia Commons. Arguably the most fascinating aspect of leafcutter ants is that the leaves they harvest are not consumed by the ants. Instead, they are chewed up and used to cultivate a specialized fungus that the colony relies on for food. The ants actively cultivate the fungus, feeding it freshly chewed up plant material mixed with saliva and feces and protect it from pests and molds that can damage it. 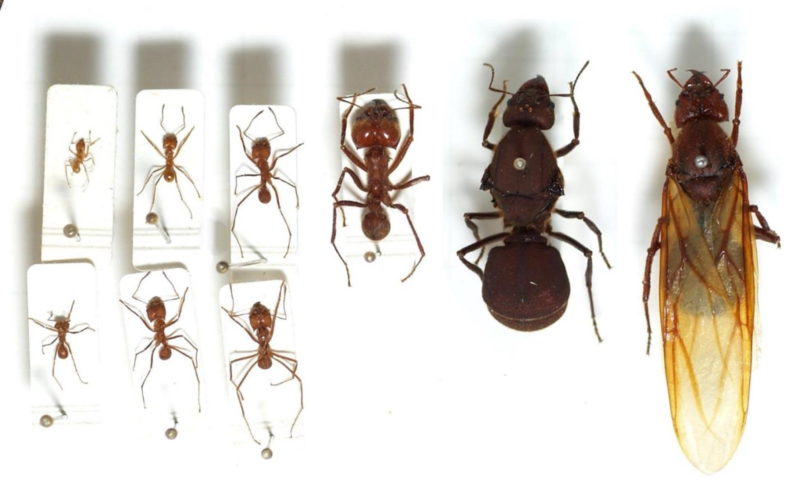 The ants are sensitive to the fungi’s reaction to different types of plant material – if the fungus reacts negatively to a specific type of leaf, the colony will stop harvesting it. There is another player in the ant-fungus partnership, a bacterium that grows on the ants and secrets chemicals that act as antimicrobials. The fungus that grows is spongy in texture and has white to grey coloration. The ants feed on the nutritious and swollen hyphal tips of the fungus. In this regard, the colony is an agricultural society that farms a crop as a food source. Christian R. Linder. Source: Wikimedia Commons. Figure 3 Specialized fungus cultivated by the leafcutter ants to feed the colony. Waste management is key for each colony’s longevity. 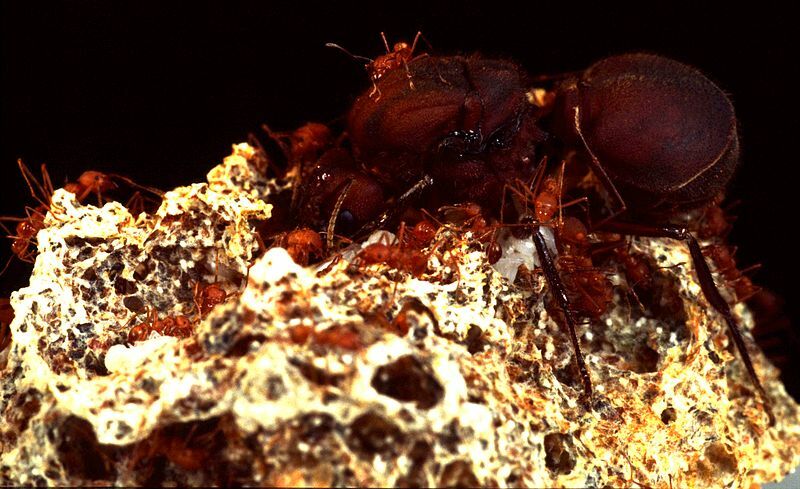 The waste transporters and waste-heap workers are the older, more dispensable leafcutter ants, ensuring the healthier and younger ants can work on the fungal garden. The waste, which consists of used substrate, dead bodies and discarded fungus is taken to the waste heap where the heap workers organize the waste and constantly shuffle it around to aid decomposition. Colony reproduction takes place in mature colonies when winged reproductive male and female ants are produced by the Queen. The winged females and males leave their nests and engage in a massive nuptial flight. Each female mates with multiple males to collect the 300 million sperm she needs to set up a colony. Once on the ground, the female will lose her wings and search for a suitable spot to found her colony. The success rate of these young queens is very low, and only 2.5% will go on to establish a long-lived colony. To start her own fungus garden, the young queen stores bits of the parental fungus garden in a cavity within her mouth. Figure 4 Atta cephalotes castes. A winged reproductive female is seen on the far right. 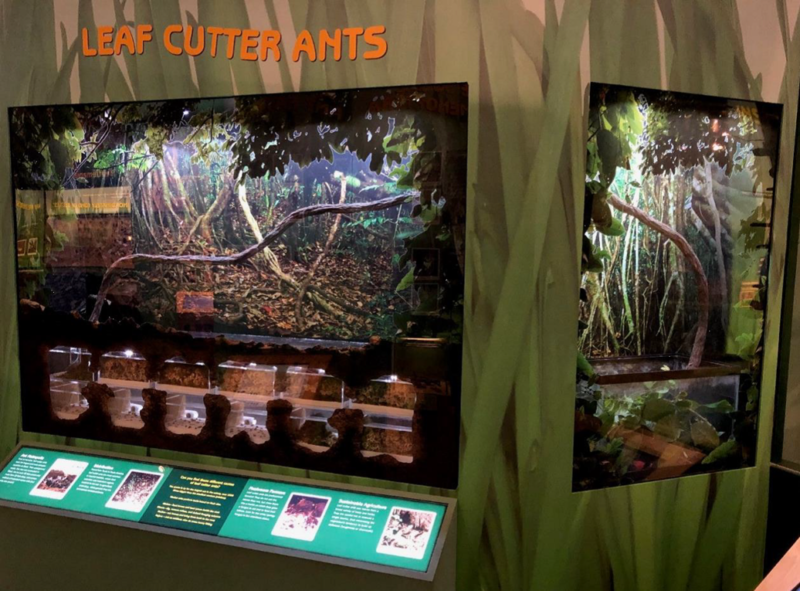 In the new CBC leafcutter ant exhibit, you can watch each caste of worker carry out their specific tasks. You can see the ants using their jaws to cut sections of leaves from the foraging area and then travel along a twisting vine back to the nest. Inside the nest boxes, you will see ants chewing up the leaves to add to the fungal garden while others clean and tend to the existing fungus. You will also observe the brood being groomed and fed within the nest. Soldiers with huge jaws will be seen patrolling the nest boxes ready to protect the colony from intruders. Lookout for the garbage dump, where ants condemned to work there collect waste and dead bodies to keep the colony clean and disease free. If you are lucky, you may even catch a glimpse of the Queen surrounded by workers as she produces eggs to grow the colony. Come check it out! Next Post A few things you should know about the Deer Park Fire & Public Safety.